Since lately I have been obsessed with DIY’s I have always been but now I want to diy everything from face serum to body moisturizer you name it, i want to try it. Have you ever been on the diy obsession train before? Anyone!!. Well i’m not ashamed to say i am and i have been loving it, it’s trial and error as you go along, because it’s also a learning process so you get better each time do do it again. And you will need a dropper bottle to put your product in i’m sure you can find that in stores, I got mine from the drugstore/pharmacy. 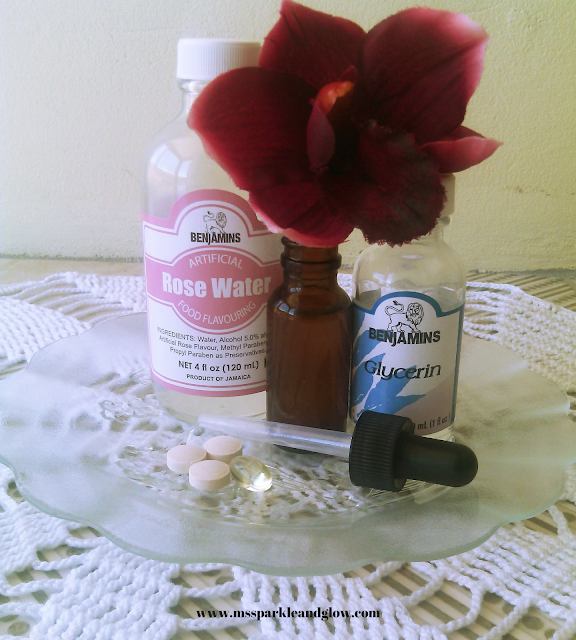 Crush all three tablets until it turns into powder try not to have any lumps add it to your rosewater and glycerin, then you extract the vitamin e from the capsule, i recommend getting the gel form and mix together and there you have it you just made your own vitamin C serum. It’s cost effective, it’s cheaper to make it than to buy it and you actually know exactly what is in your serum and not to mention it’s homemade, you can also add essential oils to it if you like eg: tea tree oil or lavender oil for a nice scent, it helps in making your skin smooth and soft, it helps in brightening the skin and keeping it looking glowing and healthy. Have you ever made your own vitamin C serum? Did you like it? whats your fav diy to do? Do you add a serum to your skincare regimen?